Scab (Sanguineous crust) under a microscope! 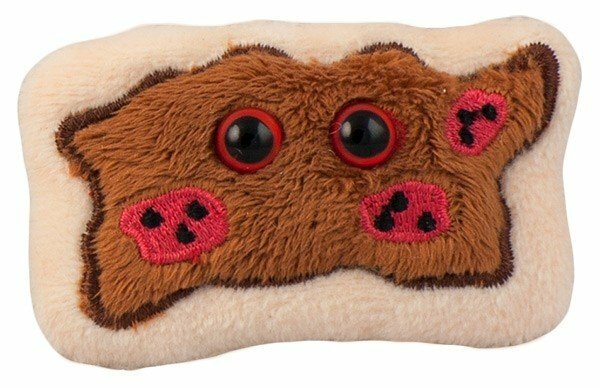 Scabs are amazing organic bandages made by your own body. Even if scabs itch and annoy you, it’s not wise to pick them. So go ahead and pick someone’s brain, or pick a number, but don’t pick your scabs! 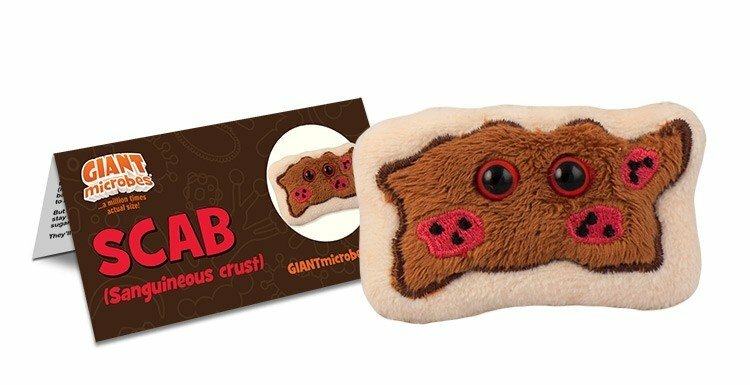 Most importantly you’ll want to pick this gorgeous scab to add to your GIANTmicrobes collection! FACTS: Scabs are amazing organic bandages made by your own body. When you have a wound, your body stops the bleeding and forms a clot. Within a few seconds, dried clotted platelets cover over the cut. White blood cells help gobble up any microbes that may have snuck into the cut before the clot was formed. To hold the clot in place, a thread-like protein called fibrin forms a structure throughout the clot. As the fibrin and platelets dry out and the bleeding stops, a shield-like cap forms over the area to protect the wound from infection while new skin grows. This all natural shield is the scab! Minor wounds heal quickly if you keep them clean. Underneath the scab, the new skin cells grow and gradually form a layer. Once the entire wound is sealed off with new skin, the scab is no longer needed and it falls off. Even if scabs itch and annoy you, it’s not wise to pick them. Premature scab picking could lead to scars and the healing process might have to start all over again. So go ahead and pick someone’s brain, or pick a number, but don’t pick your scabs!